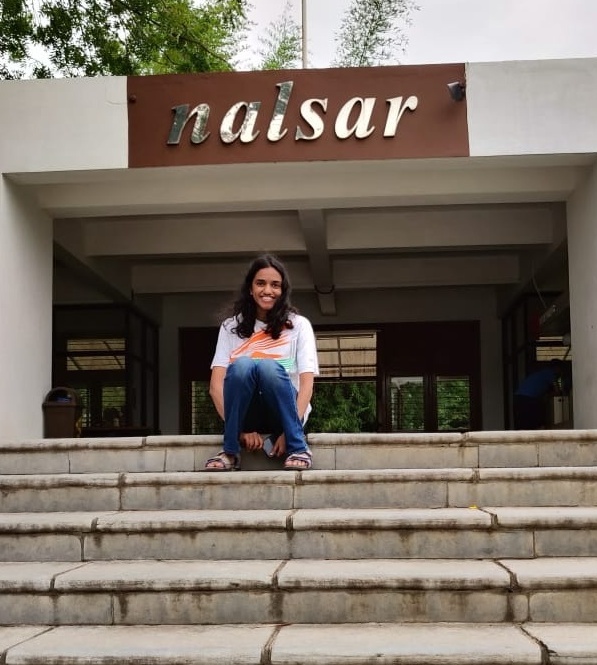 Sanjana Manusanipalli is a first year student of NALSAR University of Law, Hyderabad. I decided law was what I wanted to do since the middle of 10th grade and since then, I’ve dreamt about studying at NALSAR, Hyderabad. As soon as 11th grade began, I joined a coaching centre. However, I did not attend coaching classes in 12th grade. Although I initially joined a CBSE school, I later changed to a State Board school so that I would have more time to focus on CLAT. In 11th as well as 12th, I stopped going to school in December. Instead, I stayed at home and studied for CLAT. Since I was in State Board, I did not have too much to study for boards. My exams, for both the years, were in the first 2 weeks of March – so, other than February and the first half of March, the rest of the time I mostly spent on CLAT. In the month of April 2018, right before CLAT, I went to Chennai for a month to study at Sriram Law Academy’s one-month CLAT coaching. I’m not sure if the “one month in another city preparing for CLAT” would work for everyone but it really did for me. It was the first time I started to actually think that I had a chance and that I could actually get into Nalsar. Something about being in another city and away from home really got me to work. That month I studied like never before. Even their books were very helpful and if you can, I would recommend getting their material, even if can’t go to Chennai for the course. Most of the studying for CLAT, however, has to be self-done. Coaching can only do so much. You will find a lot of seniors telling you a lot of different things that you need to do. There is no one size fits all approach to crack CLAT. You need to find what works for you! For example, most of the seniors advised that you read the newspaper every day for current affairs and I just could not get myself to do that; instead, I looked at online sources. My strongest subjects were Math, Legal Reasoning and Analytical Reasoning. I was fine at Grammar and Critical Reasoning. I was relatively weak in other parts of English and Legal Awareness. I was awful at General Knowledge. Though quite unintentionally, I focused on subjects I was good at in 11th. I think I mostly did this because I enjoyed working on them. So, I used to solve Math and Logic books. I also worked on the Legal section to an extent. Starting with Math: I was good at this, so I didn’t spend too much time on it, especially in 12th. I practised the Quantitative Aptitude book by RS Aggarwal. After solving mocks, I would always look at how to work out the sums I couldn’t solve and that really helps because questions are often similar. As crazy as this might sound to a lot of people, I found doing Math relaxing at times – so in 12th, I would practise Math in between studying current affairs as a way of relaxing. For Analytical Reasoning, I didn’t spend much time again but I mostly practised this from mocks and worksheets given by the coaching centres. For Critical Reasoning, I did M.K. Pandey Analytical Reasoning. Practice critical reasoning as much as possible because they tend to follow a pattern. Logic was another subject I practised to relax. One general advice I would give you while solving the Math and Logic sections of the paper is to try not getting fixated on a question. There will often be a question that you can solve if you spend a lot of time on them. There will also be those questions that look simple at the first glance but as you start solving them, you realize they are not. There are also those questions you simply do not know how to solve but you want to try and see if you can figure it out. You need to learn to skip these questions. Even if you already spent some time on them, if you continue to spend more time on them, you will lose time and hurt yourself. This was something I had quite the difficulty with. I would think that if only I could spend some more time, then I could solve it but actually, I would end up wasting a lot of time on them. You have to be able to let it go. I think a huge part about answering the CLAT paper is realising which questions to answer and which not to. For English vocabulary, I did Word Power Made Easy twice. Linking the words to their roots helped me remember them. Mugging up from word list did not work for me. I was kind of bad at comprehension. They usually tend to be quite complicated and it would be difficult to concentrate and understand what they were trying to say sometimes. I would often lose my train of thought. To overcome this, I practised comprehensions from random sources, CL comprehension book, worksheets, online, Sriram book, and even SAT books, so I was exposed to different types of comprehensions. I did them with a timer. I relied on advices from various places as to how to go about solving them. I would go through them doing my best to focus. Even if there was a particular section of it that I could not understand, I would move past it and not get stuck reading the same line over and over again. If there was a comprehension that was particularly long or difficult to understand, I would skip it. It does not make sense to waste a lot of time on 5 marks (which is what comprehensions are usually for) when you can spend that time to get marks elsewhere. For Grammar, I didn’t do much – mostly from mocks and worksheets. I went through the basic grammar rules. For Legal Reasoning, I solved A.P. Bhardwaj’s Legal Awareness and Legal Reasoning For the CLAT and LL.B. Entrance Examinations book. For Legal Awareness, I mostly did the Sriram coaching centre book along with the A.P. Bhardwaj book. For Current Affairs, I took notes from August 2017 and relied on Career Launcher’s daily updates and Daily Briefs from CLATGyan. But towards the end, I only revised the notes I made since January. The week before CLAT was spent revising current affairs from CL and Sriram compendiums. I did not do any other subject. For Static GK, I attempted to do Pearson’s General Knowledge Manual (I wasn’t able to do all the chapters) and the Sriram book. I would be the first to say that GK is not my subject and taking advice from me for studying GK is probably not the best idea. They say that to be able to do GK every day, you need to fall in love with it and I could not get myself to do that. Even at the very end, I hated doing GK prep and only did it because I had to. There will be subjects you are good at and others you aren’t. Just try to do your best in each subject. Though my GK score was quite bad, I was happy with it because I did the best I could have done. When it comes to mocks, I attempted almost all the previous year CLAT papers, treating them as mocks. I did a few CL and Sriram mocks. At Sriram, in April, they gave us daily mini mocks. I did not write any other mocks other than these and a couple others in April and a sole mock in May. I know seniors usually suggest you write a lot of mocks towards the end but I found that writing mocks was only stressing me out, so I decided not to do that. As cheesy as this may sound, it is an amazing feeling to write a CLATGyan post after reading so many. Needless to say, the entire CLAT journey was not all smooth! There were moments of self-doubt and wondering what the point of all the hard work was, if I didn’t make it to NALSAR eventually. It’s moments such as walking around our campus, participating in the various events, seeing my face featured on the Photo Booth Nalsar page on Facebook (a page I constantly stalked before joining NALSAR and used as inspiration to study) and writing this article that make it all seem worth it. Everything that I have done for two years, every decision I had made was worth it because it led me where I wanted to be. Please leave a comment below in case you have further queries; Sanjana will reply to them. In case you are desperately in need of a Personalised Action Plan, please read this. This is so adorable. Hoping to be in your position next year because I am currently in the same one as you were a year ago. Thank you! I would suggest you focus more on GK the closer you get to the exam. Don’t ignore static gk. Doing it closer to the exam will help you remember. The same applies for legal knowledge. Also spend the last few months revising everything that you have done till then. Revising everything you have studied is very important! Of course this is what I did and it worked for me. Based on your strengths and weaknesses , what you should work on in the last few months would differ. Hope this helps.